Heat oven to 350°F (325°F for dark or nonstick pan). Spray bottom only of 13x9-inch pan with baking spray with flour. In large bowl, beat cake mix, dry pudding mix, water, oil and egg whites with electric mixer on low speed 30 seconds, then on medium speed 2 minutes (batter will be very thick). Pour into pan. Bake 29 to 35 minutes or until toothpick inserted in center comes out clean. Cool completely, about 1 hour. Meanwhile, place ice cream in refrigerator 1 hour to soften. Cut cake into 1- to 1 1/2-inch squares with serrated knife. In very large bowl, stir ice cream until very soft. Add cake squares; stir until cake is coated (cake pieces will break up). Spoon mixture back into pan. Smooth top. Freeze about 3 hours or until firm. Meanwhile, in 1-quart saucepan, heat whipping cream until hot but not boiling. Stir in chopped white chocolate until melted and smooth. Pour mixture into small bowl. Refrigerate 1 hour 30 minutes to 2 hours or until cold. Beat white chocolate mixture on high speed until soft peaks form (do not overbeat or mixture will look curdled). 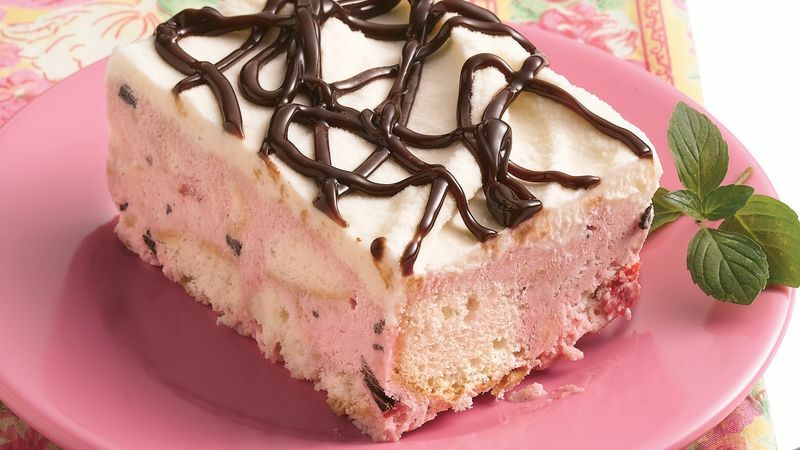 Spread over ice cream cake. In microwavable food-storage plastic bag, place hot fudge topping; seal bag. Microwave on High about 15 seconds or until melted; squeeze bag until topping is smooth. Cut off tiny corner of bag; squeeze bag to drizzle topping over cake. Serve immediately, or cover and freeze. Experiment with other flavors of ice cream.